The yuan fell to an 8-1/2-year low in November and has dropped 6% against the dollar so far this year despite the government’s efforts. The Chinese yuan keeps weakening and the warning flag is waved. Failing to respond instantly to control the corporate debt could disastrously affect China’s economy and the world as a whole. China’s economy and markets have been defying the laws of economics since 2009. Amid a worldwide financial crisis during that year, they managed to grow their economy by 8.7%. But that growth was fueled by a $586 billion dollar government stimulus package, which was followed by an additional $20 trillion dollars in new construction spending over the next seven years. China’s economy became the envy of the world as the economy expanded through the edict of government to build massive cities that were mostly vacant. In fact, estimates are that 52 million homes in China are currently vacant and 90% of those empty units were purchased for investment purposes. As investors sat on empty real estate, debt levels in the shadow banking system rose to troubling levels. A real estate bubble of this magnitude would bring most economies to the brink of destruction. But fear not; the megalomaniacs in Beijing had a solution: in 2015 they created a new bubble in the stock market to offset the fragile real estate bubble. And to accomplish this, 40 online brokerage lenders helped arrange more than 7 billion yuan worth of loans for stock purchases. As you can imagine, China’s leverage problem quickly reached epic proportions. Fueled by margin debt the Shanghai Composite (SSE) started 2015 at 3,234 and hit 5,023 by June 4th; a 150% surge from the preceding 12 months, before plunging. With markets in free-fall, the totalitarian regime made daily policy modifications in a desperate attempt to stop the bleeding. Surprise interest rate cuts by the central bank, relaxations in margin trading and other “stability measures” did little to calm investors’ angst. But eventually, the central planners stepped in and stemmed the market’s decline. However, the nation was far from out of the woods. Once a model of fiscal prudence, China became a country swimming in debt and asset bubbles. China’s corporate debt levels are now over 150% of its GDP, and estimates of total debt are as high as 280% of GDP. Consumer credit has grown by over 300% in just the past six years. In October of 2015, debt levels for consumers hit 23.5 trillion yuan ($3.41 trillion). The expectations are that this will more than double by the end of 2020, reaching nearly 53 trillion yuan ($7.66 trillion). The nation has now reached a 10-year high in delinquent corporate loans. Bloomberg reports that China has had nearly three times the number of defaults recorded in 2015. Of course, supporting the rotating carousel of real estate, commodity, and stock bubbles, while also trying to stem bond defaults, comes at a cost. All of that debt and money creation usually results in a decimated currency. However, China uses its currency reserves (held mostly in dollar denominated Treasuries) to keep the value of the yuan from falling too quickly. But what had once been China’s get out of financial crisis free card–their immense foreign exchange reserves–is dwindling at an alarming rate. November’s severe drop in reserves marked the fifth straight month of declines and are at the lowest level since March 2011. In fact, Japan just superseded China as the largest holder of U.S. sovereign debt. IMF guidelines put $2.8 trillion as the minimum prudent level for China to hold in reserves–it is closing in on that level at the current pace. The yuan fell to an 8-1/2-year low in November and has dropped 6% against the dollar so far this year despite the government’s efforts. Adding to pressure on the yuan is the newly elected U.S. president, Donald Trump, who has threatened to label China as a currency manipulator on his first day in office and impose huge tariffs on imports of Chinese goods. Pushing even further down on the yuan are the threatened three Fed rate hikes scheduled for 2017. In January, Chinese citizens will get an even lower quote from Beijing for exchanging their local currency into foreign dollars. 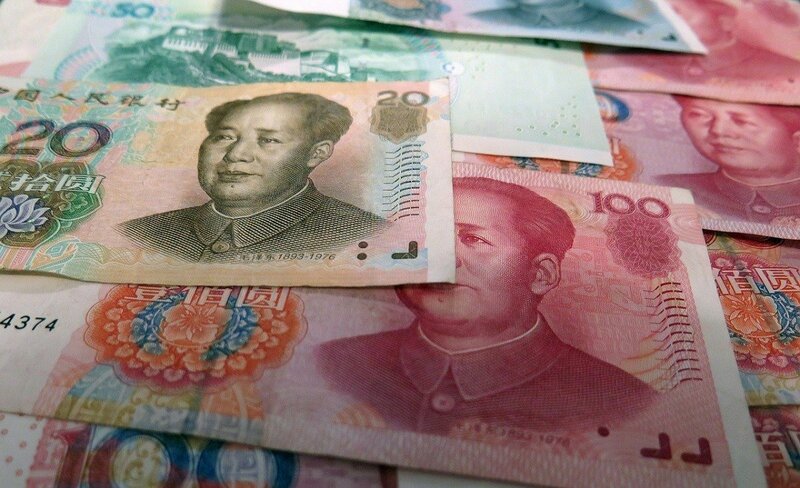 Yes, China’s government even tries to dictate the exact value of its currency. Many believe this will create a repeat of the market chaos that ensued at the start of 2016, as capital outflows surge. Therein lies China’s dilemma: Allow the yuan to intractably fall, which will increase capital flight and destroy its asset-bubble economy. Or, raise interest rates to stabilize the currency and risk collapsing asset bubbles that will crumble under the weight of rising debt carrying costs. SEE ALSO How to fix America's national debt? China embodies a Keynesian dystopia that results from central planning gone mad. It’s mirage of prosperity should soon be coming to an unpleasant end. The misguided belief any government can print unlimited amounts of money and issue a massive amount of new credit; while providing the conditions that are the antitheses necessary for viable growth, has one significant Achilles heel: eventually, it will destroy your currency. Currency is always the pressure valve that explodes in an economy that has reached the apogee of dysfunction. The Red nation isn’t the only offender on this front, but is certainly one of the worst. Therefore, China and the yuan may have finally run out of time.